A banana split is a dessert which includes a banana cut in half lengthwise (hence the name) and scoops of vanilla, strawberry, and chocolate ice cream. The dessert is topped with chocolate, strawberry and pineapple sauces, whipped cream, nuts, and maraschino cherry. The banana split was first invented by David Evans Stricklerm, a 23-year-old apprentice pharmacist from Pennsylvania, in 1904. Shortly after its invention, other ice cream entrepreneurs and restaurant owners started serving similar sundaes in Boston, Massachusetts, and Wilmington, Ohio. Walgreens, a drug retailing chain, helped spread the popularity of the new dessert. 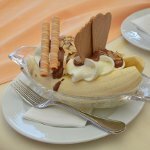 To celebrate the National Banana Split Day, make this enjoyable treat which is very easy to cook. Peel 1 medium banana, split lengthwise and place in a dessert dish. Place 1 scoop chocolate, 1 scoop vanilla and 1 scoop strawberry ice cream between banana halves. Top with 2 tbs sliced fresh strawberries, 2 tbs pineapple chunks, 2 tbs whipped cream, 1 tbs chocolate syrup, and 1 tbs chopped peanuts. Garnish with 2 maraschino cherries with stems.